Nippon Ichi Software is one of my groups of all time. They gave us Disgaea, after all. And I love Disgaea. So recently, at their 25th Anniversary Celebration, they made a huge announcement: Makai Wars is finally coming! Originally announced at E3 back in 2004 for the PSP, then the next year as a PS3 game [at Tokyo Game Show]. . . It fell into obscurity. That’s right, it’s coming, but not to console! It’s going to be an iOS/Android game and looks like it will be following the trend of RPG franchises being ported to the mobile device. That’s fine with me, because it’s still going to be a strategy RPG in the Nippon Ichi Universe! According to Questsquare.com, President Souhei Niikawa described it as a mix between YoruDorashiru and the Disgaea series. 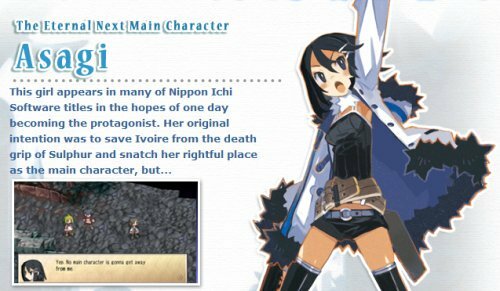 Asagi, the mascot of the Nippon Ichi games will be featured as the main character [which I love because she’s so awesome. Now I want to play Disgaea 5 again … ] and we should be looking forward to lots of cameos from the various games because that’s how this stuff works. Not to mention that Nippon Ichi is universally known for cameos. There’s also talk that Makai Wars will come to console, but that’s just talk. I have no proof of that. But I do have a brief teaser of Makai Wars for mobile, and all I can say is this, Nippon Ichi: PLEASE BRING IT TO THE WEST. PLEASE. There is no release date scheduled, but that’s okay. I’m patient. Honest. I absolutely love the idea of a mascot for a game company fighting to become a main character in a game. This might be something I would actually be interested in getting.